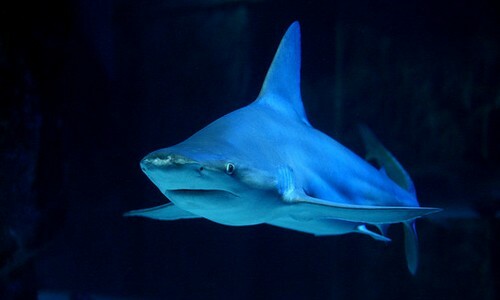 Lives in coastal ocean waters and spawns in freshwater rivers. Visits the Chesapeake Bay each spring to spawn in freshwater rivers, including the James, Potomac and Susquehanna. Move downstream after spawning and leave the Bay by summer. The hickory shad is a river herring with a thin, grayish-green body and several spots on the shoulder. It visits the Chesapeake Bay each spring to spawn in freshwater rivers. 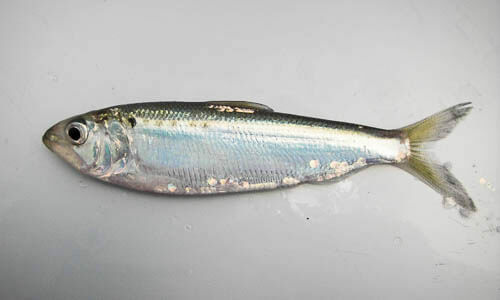 The hickory shad has a thin, grayish-green body with an iridescent silver belly and sides. It has a dark spot on its shoulder followed by several fainter spots. Its large, easily-shed scales come together at the belly to form a saw-toothed edge. It has a strongly projecting lower jaw. Shad feed on small fish, fish eggs and crustaceans. Larger predatory fish such as bluefish and striped bass prey on shad. Shad are anadromous, meaning they live in the ocean and spawn in freshwater rivers. 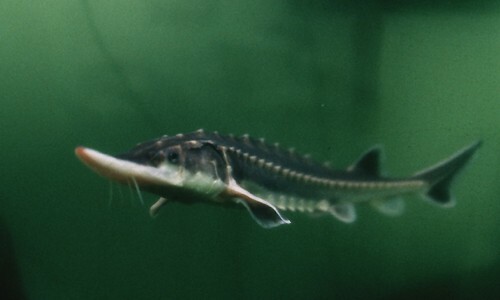 From May to early June, they migrate to the tidal freshwater rivers where they were born to spawn. Spawning takes place between dusk and midnight. After spawning, adults either die or return to the ocean. Once they hatch, young grow rapidly as they gradually move downstream. In autumn, most young leave the Bay for the ocean. Hickory shad live six to 10 years. The hickory shad can be confused with American shad and other alosids. You can distinguish a hickory shad by its strongly projecting lower jaw. Hickory shad have probably never been abundant in the Bay because the Chesapeake is near the fish’s northern limit.